The Wild Mushroom with Roasted Fennel and Chestnut Soup was my choice this week for Tyler Florence Fridays because I was craving mushroom soup, mushrooms were on sale and I decided to give fresh fennel another chance. This mushroom soup was, by far, the best mushroom soup I've ever tasted. Although I make mushroom soup several times a year, Tyler's recipe with the roasted fennel and chestnuts and the addition of Thyme was outstanding! And I'm entering my soup in the Souper Soup Challenge hosted by Running with Tweezers. Three lbs of mushrooms was just too big of a recipe for us, so I cut down the recipe. I used 1 lb white mushrooms and 1 lb Baby 'bellas, 8 c. chicken stock and 1 large fennel bulb. I could not not find the whole chestnuts and substituted a small can of Watered Chestnuts and roasted them in the oven with a drizzle of EVOO for about 5-6 minutes, just long enough to caramelize a little. The rest of the ingredients I used as listed. Put the fennel halves, cut-side up, in a baking dish and drizzle generously with olive oil. Sprinkle on a generous amount of salt and pepper. Roast for 30 minutes or until completely tender - the roasted fennel is the base of the soup, so it's important the flesh is soft enough to be cut with a spoon. When the fennel is cool, cut into 1" slices and separate. Reserve until ready to serve. Add the onion and garlic, and sauté for 4 minutes until translucent. Toss the thyme into the pan, along with the mushrooms and roasted fennel, season with salt and pepper. Cook, stirring, for 10 to 15 minutes, until the mushrooms give off their liquid. Add the chestnuts and cook for a few more minutes until they have some nice color on them. Remove about 1 cup of the mixture to save as a garnish. Reduce the heat to medium-low and simmer, uncovered, for 15 minutes, stirring occasionally. Pour the puréed soup back into a pot. Stir in the cream to make the soup even richer, and simmer gently for 5 minutes. To serve: Ladle the soup into soup bowls; garnish each serving with a bit of the reserved mushrooms and chestnuts, add a roasted fennel half, and sprinkle with chopped chives. Ooh.. it has been too long since I have had mushroom soup. Yours looks so wonderful! I love the little shrooms floating on top. So happy that you were so pleased with the recipe! This sounds wonderful! 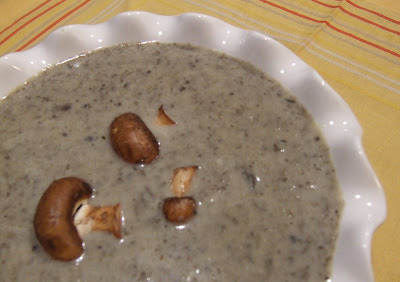 I love mushroom soup, and the addition of the fennel sounds fabulous! this soup sounds wonderful I'll have to make it soon !! Mmm that looks and sounds SO good! I love the combination of flavours. glad you liked it so much, tyler has impressed me so far on every recipe. This looks AMAZING! The flavors are so there. YUM! I can just almost taste it. Looks perfect! And I love Tyler Florence too! He is so talented. Mushroom Soup happens to be one of my favorites. Glad to know this one is so good. I'm putting down on the "to try" list. Ooh, i just tried fennel and liked it, this sounds fantastic!! That looks great. I love mushroom soup! Is the picture above taken in your kitchen? GORGEOUS! That is alot of fennel! Soup looks wonderful, and I have not had good mushroom soup in forever. I lie the sound of the mushroom and chestnut combo. What an amazing combination! Now I'll have to find some dry-canned chestnuts; this looks just to good to pass up! A Very belated Thank you(s)!